Need more information about booking Home 6628370 ? This beautifully appointed two bedroom Grade 1 listed Georgian apartment is situated in the heart of the historical Hamilton Square on the Wirral Peninsula. This newly refurbished apartment offers free parking and all the mod cons you need for a short or long stay, whether your stay is for business or leisure. Situated on the 2nd floor with beautiful views across Hamilton Square and the Town Hall. Hamilton Square boasts the most Grade 1 listed buildings second to Trafalgar Square in London. Built in 1826 and designed by Edinburgh architect James Gillespie Graham. Hamilton Square is the ideal location for visitors seeking to explore the Wirral peninsula with its many local attractions, stunning coastline and rolling lush countryside, the world famous Liverpool, home of "The Beatles”, the stunning historical medieval City of Chester, Chester Zoo, Albert Dock Liverpool, Royal Liverpool Golf Club, and the rolling hills of North Wales are all within close proximity. It's the perfect location to do as much as you want or as little as you wish. Whether you are looking for shopping, nightlife, tourist attractions, culture, the arts, museums, art galleries, maritime heritage, sandy beaches, golfing, fishing, walking, horse riding, cycling and other outdoor pursuits, the Wirral peninsula offers a wealth of things for you to do and explore. It is also the perfect for those wishing to explore further afield the Lake District, Peak District, Yorkshire Dales, and Snowdonia National Park and beyond. Hamilton Square train station is just a 2 minute walk from the apartment, trains run frequently and are the perfect way to travel if you are on foot. Liverpool is only one train stop away. Trains to Chester also run frequently from Hamilton Square. Liverpool Lime Street train Station is only 3 stops away with major connections to destinations throughout the United Kingdom.The train from Liverpool to London is approx. 2 hours travelling time. Buses are also a great form of transport if you are on foot. There is a bus stop directly outside the apartment. The main bus depot is in the centre of Birkenhead only a short walk away with bus routes to many local areas on the peninsula and beyond. If you are travelling by car the A41, and M53 Motorway is only a short distance away connecting you to all the major road links. The Mersey Tunnel is approx. 2 mins away by car and connects the Wirral peninsula to Liverpool under the famous "River Mersey".Liverpool John Lennon Airport is approx. 25 mins by car. Manchester Airport is approx. 45 mins by car. 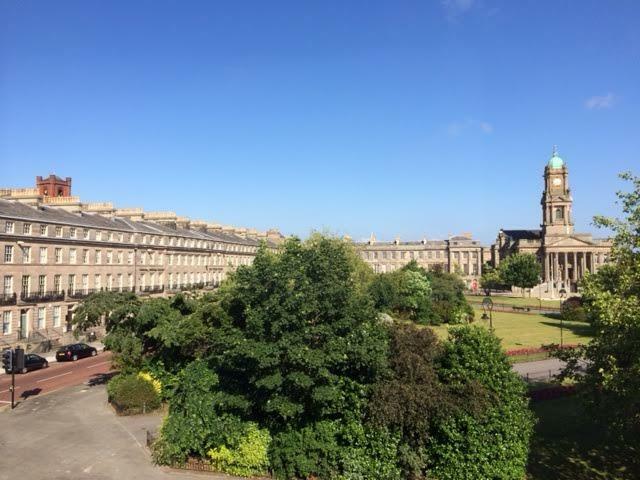 Staying in Hamilton Square is an experience in itself, situated within the Square it is a wonderful opportunity to stay in a beautiful Georgian historical building dating back to 1826 stepped in history. The apartment comprises of a large open plan living room, kitchen and dining room. The open plan living area boasts three beautiful light filled Georgian sash windows overlooking the Square. You can sit and watch the world go by. You can even see a glimpse of the River Mersey and the Liverpool skyline when you look out the window. The décor is modern and has been newly furnished throughout. The kitchen is fully equipped with integrated appliances including a dishwasher with everything you need to make a gourmet meal. The apartment features a three seater couch, two seater couch, and occasional chair. TV, DVD player, and dining table and chairs. There are an abundance of travel books, tourist information books, leaflets, train timetables, bus timetables, take-away menus, DVDs and games for our guests to enjoy. The utility cupboard houses a washing machine, microwave. The main bedroom comprises of a King Size bed, bedside tables, clothes rail, ottoman, wall mirror, full length mirror, venetian blind, with a pull down block out blind. The bedroom is tastefully decorated and the bedding is Egyptian cotton with a high thread count. All linen and towels are supplied. The second bedroom consists of a double bed with single bed bunk on top. This room sleeps 3 people. The room also features a clothes rail, TV, ottoman, and bedside table.The spacious modern bathroom consists of WC, full size bath, shower over bath, glass screen, and stainless heated towel rail. This Apartment has 2 bedrooms, 1 bathroom and sleeps 5. It’s been listed on Holiday Lettings since 23 Jun 2015. Located in Wirral, it has 32 reviews with an overall rating of 5. The average weekly rate is £553. The Owner has a response rate of 100% and the property’s calendar was last updated on 01 Apr 2019. You'll need to send Caroline (the owner) an enquiry to book - the owner will let you know how to pay. If they accept online booking they'll send you a quote and info on how to pay. If you pay through our website you’ll be covered by Payment Protection. Or you can send Caroline (the owner) an enquiry through the contact form to request a quote. Caroline (the owner) will email you the total cost for your dates and how to pay. Send Caroline (the owner) an enquiry through the contact form requesting a quote for your holiday dates. Caroline (the owner) will email you the total cost for your dates and how to pay. Caroline (the owner) of this property is responsible for taking and refunding your damage deposit. The damage deposit terms should be agreed before booking and outlined in the booking contract, if Caroline (the owner) supplies one. Please refer to these details or contact Caroline (the owner) directly if you have any questions. You'll need to contact Caroline (the owner) to cancel. They should have provided their contact details when you made your booking - otherwise, email them through the contact form. You'll need to contact Caroline (the owner) to edit your booking. They should have provided their contact details when you made your booking - otherwise, email them through the contact form.